Hopton-Wood Limestone was first quarried about 1820 in Hopton Wood at the West end of Via Gellia, 1.5 miles West of Middleton. The limestone was very fine, almost like marble, used for over 100,000 War Graves, though now worked out. 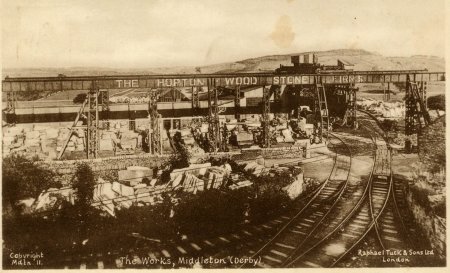 The Western outcrop was quarried by Hopton-Wood Stone Co, the Eastern (almost in the village of Middleton) by Killer brothers, beginning about 1870. In 1905 the two firms merged. The number of quarry workers from Middleton and Wirksworth rose from 61 in 1871 to 234 in 1901, from the 8th to the most common job among males over 10. See Hopton-Wood Stone in this website.